Recently, I got to visit the #1 most enlightened town in America (UTNE), the #1 emerging city in the US, #2 green city in the us, and a vegetarian friendly town, yet to be on a top 10 listing, but perhaps it should be since it is home to the famous Moosewood Restaurant and lesser known veggie friendly places like the ABC. 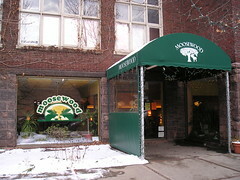 Moosewood, THE resource for vegetarian recipes in the 70′s, has published 11 cookbooks and is a collectively owned business. I was always under the assumption that they emphasized healthy, ovo-lacto vegetarian foods, in “creative vegetarian cooking.” I do not agree with them. The first cookbook I encountered was one left behind in a rental house in college. It was quite old, but the recipes had a LOT of ingredients in them, many that I couldn’t find in rural Connecticut. I don’t think I cooked one recipe from it. For a gift one year, I received the Daily Special (the soups and salads book) which I really enjoyed. The recipes were involved and called for a lot of ingredients but most came out good. My only concern was the liberal use of dairy and lack of protein in the recipes. I felt my visit the restaurant would be like a Mecca experience, like I had come home to the heart of vegetarian cooking and would be blown away. Perhaps my expectations were too high, because my experience with the cookbook was much the same in person. Don’t get me wrong, I enjoyed the food, but I don’t think I would call it creative vegetarian cuisine since there was FISH on their menu and the foods were quite heavy in the dairy/egg department, not what I would call healthy or emphasizing “healthful natural foods cuisine.” Perhaps the eggs are from happy farms, but they are still loaded with cholesterol and possibly pesticides/chemicals from the chicken’s feed. When did it become acceptable for restaurants to tout themselves as vegetarians then as a sidebar note they serve fresh seafood. Hello?! I can understand wanting to appeal to the fish eater, but just don’t call yourself a vegetarian restaurant anymore. OK, I’ll calm down but it’s a huge pet peeve. Saying you are vegetarian and eating fish sometimes is like saying you are married but occasionally you sleep with other people. Why not just label yourself as you are or if you are transitioning, say so. The veg*n police is not real, but it is quite offensive to me for people to call themselves veg*ns if they aren’t. It gives quite a bad rap for those out there who live what they believe. So, onto the dinner. I like that the menu changes to reflect seasonality, but there were only 4 entree choices, one vegan, one fish. We got the 3 veg*n entrees and split them among us and skipped dessert (when I’m trying to eat less dairy and my choices are tiramisu, cheesecake and a fruit crumble..the vegan option is quite disappointing and non-creative). Salad: Basic greens with shredded carrots. We tried all the dressings and my favorite was the Miso-Ginger. #2 was the Lemon-Tahini. The feta-garlic dressing was not strong on the feta or the garlic. The house dressing was also disappointing. It was a creamy spinach basil dressing. It was green and creamy but the basil didn’t stand out and when it’s covering just a bunch of romaine and two olives, it was kind of a let down. The miso-ginger was bold and delicious, a nice balance for the simpleness of the salad. I felt the same way about the tahini. We split a pitcher of Ithaca Beer Co.’s Cascazilla (YUM! Some of the best micro-brew I’ve had in awhile). Entree 1: Spanakopita: Classic Greek dish filled with spinach and feta cheese. It did not disappoint in flavor. The filo was crispy on the outside and doughy where it touched the filling. The portion seemed a bit small, but it is heavy on the dairy and full of expensive ingredients. The accompaniment was some pickled vegetables, which I thought was a bit strange. My only complaint (my continuous complaint as I expect restaurants to served balanced dishes) was the lack of protein. Dairy is not an adequate protein source. Perhaps they could have added pine nuts to the filling? I’ve just spent almost half a lifetime of people assuming vegetarian equals the same meals as omnivores, just minus the meat. People tend to forget that there are plenty of protein sources out there (remember beans? nuts? it doesn’t just have to be a bland slab of tofu). When something is taken away, you don’t add more cheese or vegetables. It is important to remember our good friend protein. In my nutrition class at school, we learned the average DAILY portion size of meat is a deck of cards. So we don’t need a 1 lb steak with every meal like some people believe. But I wholly disapprove of relying on dairy to meet our protein needs. But yum! I love spanakopita. Entree 2: Jerk Tofu with Vegetables over Brown Rice. The tofu was firm (local Ithaca tofu) and it’s seasoning was delicious. I could have eaten a whole bowl of just the tofu. The serving size seemed right on, the veggies were good (a little undercooked) and the rice was steamed to perfection. I’m glad we ordered two of these dishes for our table. Entree 3: Eggplant and Tomatoes over Egg Noodles with lots of cheese. I expected more from this dish. The eggplant was a little undercooked (for my liking). The proportion of noodles to sauciness was perfect. But, once again, where’s the protein? Is there enough protein in the egg noodles to satisfy the daily requirement? I’d have to do a nutritional analysis. I think this dish would be better as a side or served with bread to sop up the juices. I think it’s more of an Italian 1st or 2nd course, before the entree. Not my favorite, but some in the group liked it very much. Perhaps I’m just picky, but when I hear a place tout themselves as creative vegetarian, I hope for new ways to have vegetables, a variety of protein sources and whole grains. Overall, Moosewood’s food is great, home-style cooking. It’s food that the majority of omnivores would eat and not be scared by it. It’s stuff that I would and have made at home. It has familiar ingredients and dishes to please most people and I like that the menu changes. I just think they should have stuck to their guns before allowing the fishes to enter their menu and if they want to be innovative, let’s try creativity for 2007, not 1978 anymore. People are eating out and learning more about food than before. It’s time to start challenging the palate and places like Candle Cafe stand out to me as creative, local foods with fun spins on classics that have balanced meals. Sorry, Moosewood. Our service was slow and inattentive as well. I would return, but not in a hurry. I’m glad to know I’m not the only one. Wow – sorry to hear you didn’t like the Moosewood Restaurant!